When the requisition button is clicked the list of items that need ordering are populated. The user still has the opportunity to edit the vendor, the quantity and the costs before processing it to a purchase order. To create purchase orders immediately, click the ‘Process’ button. The PO number will then get written to the requisition list and if it was created from within a sales order or production order, the PO number will get written to the line of the sales or production order. 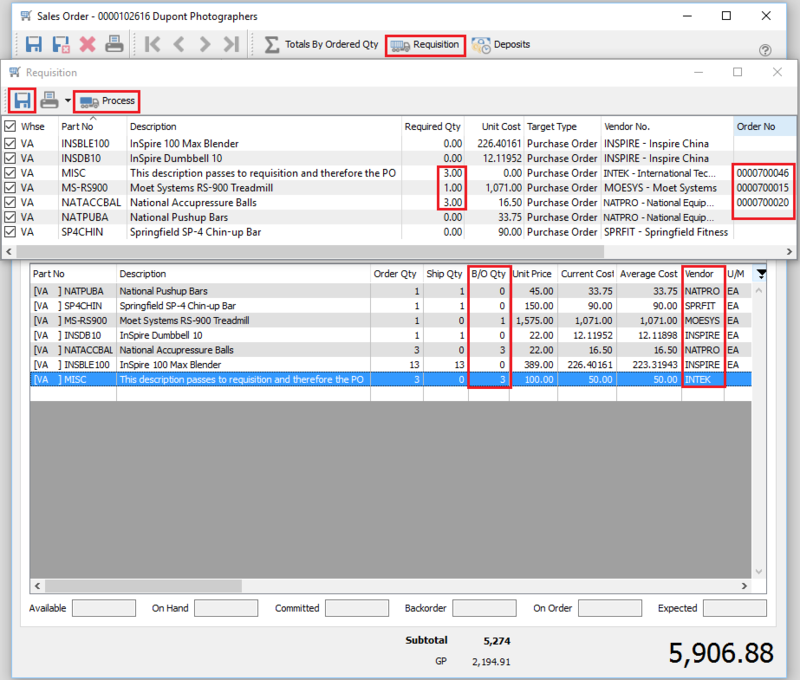 When the PO gets created or if adding to an existing PO, the sales or production order number gets written to the PO detail line along with the customer number. This is helpful so that the person receiving the purchase order knows who the items are for and does not store them in the warehouse. If the requisitions are saved and not processed, then the user or someone else will need to go to the requisition module to process the requisitions to PO’s or production at a later time.